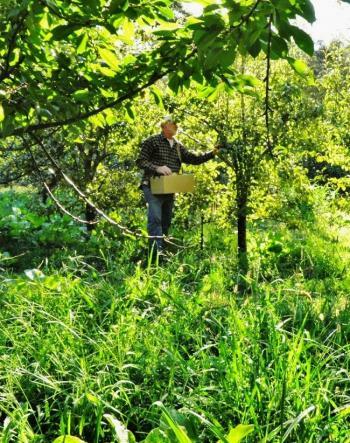 Woodleaf Farm's goal is to build and manage habitat for biological control organisms (such as insect predators and parasites, birds, bats, soil and foliar microorganisms), thereby suppressing pests, minimizing the use of insecticides, and producing high-quality fruit. Fruit yield and quality losses to insects have mostly decreased over 30 years according to Carl Rosato. This observation is supported by spray records showing reduced use of insecticides since the late 1990s (Fig. 1). Sprays are no long applied for aphids, oriental fruit moth, peach twig borer, codling moth, or Western flower thrips. Nonetheless, total insect damage to peach, pear, and apple crops averaged less than 10% in 2013, 2014, and 2015 (Table 3 and Table 4). However, insect damage to unsprayed cherries in 2014 from spotted wing drosophila was 30%. Insect damage to peach fruit at harvest averaged 1.6% (2013) and 1.8% (2014), mostly due to thrips and oriental fruit moth; and 3.2% in 2015, mostly due to oriental fruit moth. Codling moth damaged up to 30% of the apple crop annually in the 1990s according to Carl. Recently, harvest evaluations record damage to apple and pear crops at 12% (2012), 9.4% (2013), 7% (2014) and in 2015 10.2% (apples) and 3.7% (pears). Thrips now occur at noneconomic levels, likely due to the presence of habitat for predators and selective mowing. Spotted wing drosophila remains a challenge, primarily on cherries. Woodleaf's system does not suppress this pest, and it is currently managed with applications of Spinosad (Entrust™). In 2013, the marketable peach crop was 79% premium grade, 17% off-grade (small, misshapen, cracked, minor insect scarring, or overripe fruit). In 2014, 86% was premium grade and in 2015, 81% of fruit was sold as premium grade. Field monitoring from 2013 to 2015 revealed relatively high season-long diversity and population densities among predator and parasite species (Figs. 2A and 2B, Figs. 3A and 3B). 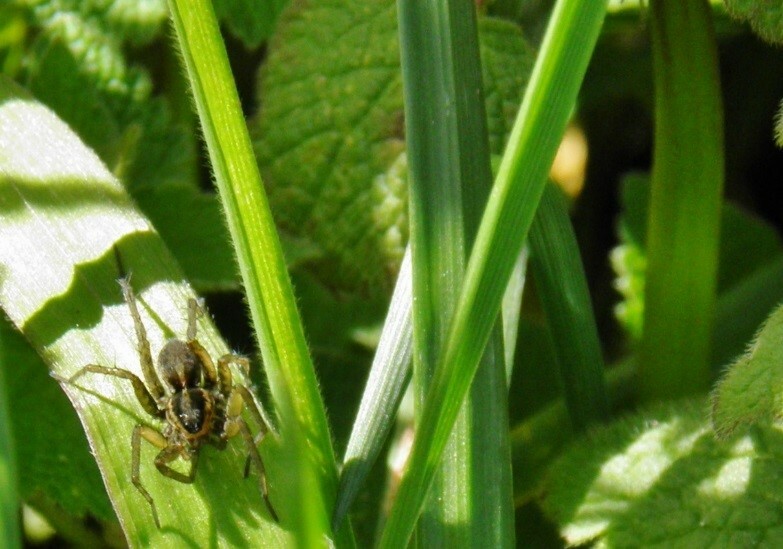 More than 15 spider species are found in high numbers year-round, both in the living mulch and on crop plants, including an abundance of wolf spiders (Araneae: Lycosidae) (photo below left). Several species of syrphid flies (Diptera: Syrphidae) are regulars all season. They seem to prefer nectar of chickweed (Stellaria media, photo below right) and Persian speedwell (Veronica persica), both of which occur in the living mulch in an interspersed pattern beneath crops. Other common generalist predators include ground beetles, particularly carabid (Carabidae) and rove (Staphylinidae) beetles, lady beetles (Coleoptera: Coccinellidae), soldier beetles (Coleoptera: Cantharidae), lacewings (Neuroptera: Chrysopidae), assassin bugs (Reduviidae), banded thrips (Aeolothripidae: Aeolothrips spp. ), and nabid bugs (Nabis spp.). Parasites include wasps in the Aphidiidae, Braconidae, and Aphelinidae families. Pesticide applications have been significantly reduced over the past 20 years (Fig. 1). From 1998 through 2005, Bt (Bacillus thuringiensis) was applied regularly on peaches to control peach tree twig borer and oriental fruit moth. It was also applied in some years on apples for codling moth. Spinosad (Entrust™) was applied regularly on peaches for thrips (2007–2013) and on cherries for spotted wing drosophila (2008–2013 and 2015). PyGanic® was tried in 2004 on peaches for oriental fruit moth, but was abandoned because Carl felt that it killed too many predators. The only insecticide currently applied at Woodleaf is Spinosad (Entrust™) on cherries for management of spotted wing drosophila. Woodleaf's solution to insect pest problems is to build interspersed habitat for generalist predators and parasites within crop fields. Knowledge and monitoring of ecological relationships among crops, habitat, and pests are part of the insect pest management system (Table 1). Habitat building at Woodleaf does not include common strategies such as installed insectary plantings, woody hedgerows, or grassy beetle banks. Instead, the farm is designed as small (1- to 1.5-acre) crop fields separated by remnant oak/pine native forest. Cover and food sources for beneficial organisms are distributed within fields and in close proximity to crops, rather than in blocks or rows on field edges. Cover and sequential, season-long sources of nectar, pollen, sap, and seed for beneficial organisms. The living mulch bloom sequence extends from early February through late December. Species composition: At planting, the living mulch is a mixture of several nonnative grass and clover species. Within 2 or 3 years, it becomes a naturally diverse mix of weeds and planted species, including fibrous-rooted grasses; nitrogen-fixing legumes; tap-rooted perennial weeds, such as curly dock (Rumex crispus); and flowering annual weeds, such as chickweed (Stellaria media). Winter- and spring-blooming annuals include purple deadnettle (Lamium purpureum), chickweed (S. media), and Persian speedwell (Veronica persica). Summer-blooming perennials include curly dock (R. crispus) and yellow nutsedge (Cyperus esculentus). Chickweed is an important plant in Woodleaf's perennial living mulch. It blooms from February through May, when it seems to be a preferred host for syrphid flies (Diptera: Syrphidae). Aphids associated with chickweed may also provide early-spring prey for predators and parasites when pest populations are low, thus avoiding gaps between pest and predator arrival on crops. Selective mowing: Carl's mowing practices have evolved since the 1990s, when he mowed the living mulch regularly for frost control and ease of farm work. Now he allows groundcover to grow wild and species to flower and produce seed all season before mowing. Carl particularly avoids spring mowing from peach bloom to fruit set so as to avoid disturbing predators and parasites of western flower thrips. Thrips populations are highest and most damaging to peach crops at first fruit set. Higher pest thrips populations were observed in peaches immediately after mowing the living mulch in 2013 and 2014. 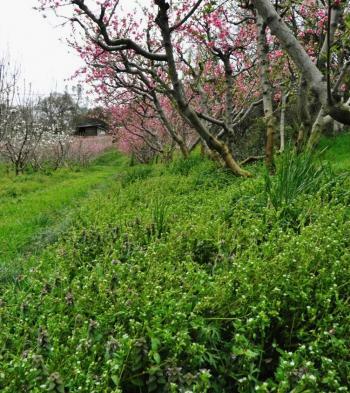 Carl also manages the ground cover within the orchard so that some areas (at least 30%) are undisturbed and blooming throughout the season. Interspersed pattern: Interspersed habitat-building means that cover and food sources for beneficial organisms are distributed randomly within and in close proximity to crops, rather than in blocks or rows around or on crop edges. Hence predators and parasites do not have to move far from cover and food sources into crops. During field monitoring, predators and parasites are found within tree crops and in the living mulch beneath and between trees. Table 2 shows strategies, biological control organisms, supplemental pesticides, and outcomes for specific pests. No insecticides have ever been applied to manage aphids, due to low aphid incidence and high numbers of aphid predators. From 2007 through 2013, Spinosad (Entrust™) was applied one or two times per year to control thrips on peaches. In 2012 and 2013, only one half-spray (every other row middle) was applied at petal fall, when early peach varieties were forming fruits. This spray was applied when western flower thrips reached a threshold of one thrip per branch. No insecticides were applied to manage thrips in 2014 or 2015. Sulfur is applied at bloom to all peaches as part of Woodleaf's foliar mineral mix spray program. Higher thrips populations were observed in peaches after the living mulch was mowed in 2013 and 2014. Damage decreased in slightly in 2014 and significantly in 2015, when Woodleaf began selective mowing. Bt (Bacillus thuringiensis) was applied 1998-2005 for peach tree twig borer and oriental fruit moth. Two or three sprays were usually applied from bloom through fruit set. Application of Spinosad (Entrust™) for thrips control (2007–2013) may have provided some control of worm pests. Bt was sprayed for codling moth in 1998 and 1999. Carl felt that it was not effective. Since the late 2000 no insecticides have been applied to pears or apples. Mating disruption pheromones have not been used. Spotted wing drosophila (Drosophila suzukii) arrived at Woodleaf in 2007. It is still a challenge on cherries and is not suppressed by the system. In 2014, Woodleaf did not spray cherries because the crop was very light, and Carl hoped that natural enemies would manage SWD. This strategy was ineffective, and SWD caused 30% damage to cherries that year. SWD is now managed by two or three applications of Spinosad (Entrust™) at 7- to 10-day intervals just as cherries begin to ripen. In 2015, this program provided good control of SWD (96% undamaged cherries). In most biologically diverse native plant communities, natural enemies (e.g., insect predators and parasites, microorganisms, birds, and bats) regulate plant pest populations. Diverse plant landscapes, as compared to monoculture agriculture, are correlated with increased diversity and density of biological control organisms (Thies, 1999). Systems management for insect suppression aims to reintroduce into farm systems some of the ecological relationships and functions found in undisturbed plant communities. It has been hypothesized that conserved or introduced natural enemies might reduce agricultural insect pests. In some crop/farm systems, natural enemies do provide enhanced pest management (Thies, 2003). However, this is not always the case, since pest populations may also respond positively to landscape and farm diversity (Thies, 2005). Building and managing habitat includes providing food and sheltered areas for biological control organisms to mate, reproduce, and overwinter. Nectar, pollen, sap, and seed are important alternative food sources that fuel predator and parasite survival, flight, and reproduction (Wilkinson and Landis, 2005). These practices support an assemblage of natural enemies that may contribute to lower pest damage, including predators and parasites (Figs. 2A and 2B, Figs. 3A and 3B). Woodleaf's pattern of interspersed habitat may be key to success. Some evidence indicates that predators and parasites move no more than 60 to 100 meters from undisturbed habitat into crops (Morandin, 2014; Long, 1998; Thomas, 1991, 1992, 2002). 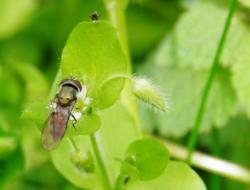 Some research supports Carl's observation that chickweed is an important host of biocontrol species. Species observed feeding on chickweed nectar include numerous species of syrphid flies (Diptera: Syrphidae), three species of Tachinidae (Diptera), Hymenoptera species (including braconid, ichneumonidae, and vespid species), and six species of ants. Green peach aphids were also observed on chickweed (Batra, 1979). Aphids associated with chickweed in Woodleaf's perennial living mulch may provide prey for predators and parasites in early spring, when crop pest populations are low. This food source minimizes gaps between pest emergence and predator/parasite arrival. Chickweed also provides seeds for birds, which may feed on insect pests such as codling moth and oriental fruit moth (Firbank, 2002). Aphids: Syrphids, spiders, parasitoid wasps, and lady and soldier beetles have been observed feeding on or parasitizing aphids in peaches, plums, pluots, and apples at Woodleaf. With the exception of soldier beetles, all of these predators and parasites were found to be strong aphid predators in an Oregon study (Ambrosino, 2006). Thrips: Banded thrips and crab spiders have been observed feeding on thrips in peaches at Woodleaf. There is some evidence that increased on-farm plant diversity increases biological control of thrips (Nicholls, 2000). Oriental fruit moth: By providing alternate hosts for predators and parasites, Woodleaf's living mulch reduces gaps between pest and predator/parasite emergence. This factor may contribute to oriental fruit moth suppression. One study found that oriental fruit moth decreased in orchards where a diversity of weed species provided alternate hosts for the parasite Macrocentrus ancylivorus (Bobb, 1939). Codling moth: Ground-dwelling predators (spiders, rove beetles, and carabid beetles) have been observed in relatively high numbers at Woodleaf (Figs. 3A and 3B). Research supports the theory that these predators may aid in codling moth suppression. Research in California indicates that ground-dwelling carabid beetles feed on codling moth (Riddick, 1994). Spiders are reported to be important predators of codling moth (Bogya, 1996; Dondale, 1979). Uncultivated orchards were attacked less severely by codling moth, compared to continuously cultivated orchards (Peterson, 1926). Parasitism of codling moth larvae was significantly greater in diverse grass/clover/weed flowering orchard understories than in cultivated, bare-soil understories (Bugg, 1994). Woodleaf's patchwork design of 1- to 1.5-acre fields separated by remnant oak/pine native forest habitat also seems to favor birds. Many species of birds have been observed moving from forest margins into crop fields. Birds are reported to be very important predators of codling moth, feeding mostly on larvae and pupae, but also on adult moths (Falcon, 1991). This pest became a problem in the area in 2008. Since its arrival at Woodleaf in 2009, it has presented an increasing challenge. Damage is greatest on cherries and kiwis and is occasionally seen on ripe peaches. Woodleaf's system does not control this pest. When cherries were not sprayed in 2014, SWD damage reached 30%. Woodleaf selectively mows the living mulch under cherry trees short when fruit begins to form in order to decrease humidity. High humidity is reported to enhance drosophila survival and reproduction (Walsh, 2011). See also the eOrganic webinar on Biologically Based Organic Management of Spotted Wing Drosophila. This article was developed with support from USDA's National Institute of Food and Agriculture through the Western Sustainable Agriculture Research and Education program under grant number SW13-017. Falcon, L. A., and J. Huber. 1991. Biological control of the codling moth. pp. 355-370 in Van der Geest, L. P. S. & Evenhuis, H. H. (Eds) World crop pest; tortricid pest: their biology, natural enemies and control. Vol. 5, 788 pp. Elsevier, Amsterdam. Firbank, L., and S. Smart. 2002. The changing status of arable plants that are important food items for farmland birds. Aspects of Applied Biology 67: 165–170. Peterson, A. 1926. Oriental fruit moth damage in cultivated and uncultivated orchards. p. 83–86. In Proceedings, Annual Meeting of the New Jersey State Horticultural Society, NJ, 1926. Wilkinson, T. K., and D. A. Landis. 2005. Habitat diversification in biological control: The role of plant resources. In: Wackers, F.L., van Rijn, P.C.J., Bruin, J. (Eds. ), Plant Provided Food and Plant– Carnivore Mutualism. Cambridge University Press, Cambridge, U.K.